The latest incarnation of a historic stone building in the Cotswolds - once a theatre in the mid 80's, the brewery building has been converted to an exceptionally executed EnerPHit Youth Hostel operated by New Brewery Arts. The Barrel Store has 14 rooms and can accommodate 40 guests. A unique building in many respects - it is rare for such a heritage building to be upgraded to EnerPHit. 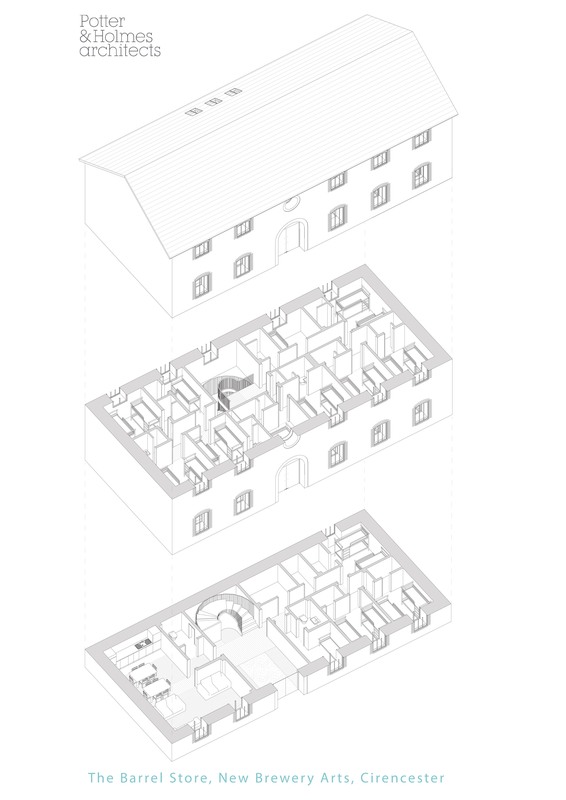 The internal layout is of a generous entrance hall with a top lit winding oak staircase lined with ash boarding with a common lounge and kitchen to one side at ground floor level, and to the other laundry, linen store, disabled persons adapted bedroom and shower room and other bedrooms with 30 bedspaces at first floor level. The building consists of a timber frame built within the old stone walls, on an insulated raft. Upgrading the insulation to Passivhaus levels was a key challenge. The existing building had a good form factor, and relatively high internal gains, so the team were keen to meet EnerPHit Standard via the energy approach rather than the component approach. The retrofit elements presented major challenges, but we had a relatively blank canvas to start with. Achieving Enerphit via the calculation route felt like an achievement none the less! A key challenge was that the building was heavily over-shadowed, and the conservation heritage constraints limited the opportunity to create new openings. All glazing has extremely deep reveals, and as a percentage of the treated floor area, is a modest 8% which minimises the impact of solar gains, and ensures summer comfort. The nature of the building dictates a high domestic hot water (DHW) demand, and based on the analysis of gas bills, it is performing as intended. Internal gains are mitigated via an efficient DHW distribution. A large, efficient direct-gas water heater provides DHW, and the residual space heating (~3kW) takes heat from the DHW store via a PHX. Each bedroom is provided with a small radiator. DHW distribution is a radial system with one pipe per bathroom. As it is located too too far from the cylinder, the kitchen has an electric point of use water heater. Ventilation is provided via two Helios commercial MVHR units (Passivhaus certified components) mounted in the loft space, serving the left and right halves of the building. Each typical bedroom is ventilated as a ‘closed cell’ with supply into the bedroom and extract from the en-suite WC/shower, to avoid acoustic issues with air transfer through the bedroom doors. Ventilation is demand-controlled based on relative humidity, and supplemented with natural ventilation via windows. It is intended to fit a comprehensive energy and IAQ monitoring system over the Summer of 2018. The ventilation control strategy could be improved. Although nice and simple, some rooms are suspected to be under-ventilated at times. The entrance door had to fulfil several constraints not related to Passivhaus/Energy. It’s performance in terms of airtightness could have been better. The UK market for Passivhaus quality doors (residential and commercial) has room for improvement. Some funding was contingent on certification which maintained pressure to achieve it. We’re really excited to see the project come to fruition and know that it will be a great addition to Cirencester and the County. The EnerPHit status is a bonus and hopefully the success of our project will be a pilot for more projects like this in the future.